I really love it when an artist who was known as a hard rocker for several decades turns the tables a bit and shows was an amazing musician he or she is. I thoroughly enjoyed last year’s Piano by ABBA co-founder Benny Andersson and find myself enthralled by Rick Wakeman’s Piano Odyssey. Probably best-known for his work with the band Yes, Wakeman’s 1973 solo release, The Six Wives of Henry VIII, was one of my favorite albums for a lot of years. (I still have it on LP!) Wakeman recorded the album with his favorite piano, a Steinway Model D grand at The Old Granary, a recording studio in a restored 18th century English barn. 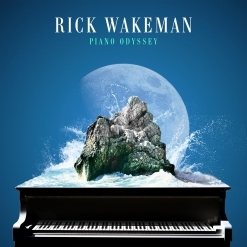 All twelve tracks on Piano Odyssey were chosen, arranged and orchestrated by Wakeman, taking the listener on an aural retrospective of his career while celebrating key moments along the way. Rick Wakeman was born in England in 1949 and started showing musical promise very early. He began studying classical piano at the age of 7 and enrolled in the Royal College of Music at 14, planning to become a concert pianist. However, he was dropped from the college when it became clear that he preferred playing in clubs to studying piano technique. By his late teens, Wakeman was an established session musician and played on records by Black Sabbath, Brotherhood of Man, and Edison Lighthouse, to name a few. Soon after that, he was playing on records by artists that include Al Stewart and David Bowie. Wakeman joined The Strawbs in 1970 and did two albums with them. Then he joined Yes and toured and recorded with them off and on for several decades. Wakeman also released a large number of albums under his own name. The twelve tracks on Piano Odyssey include fascinating arrangements of pop and classical music as well as several original pieces. Most of the tracks include strings and several include choral voices. Personally, I would have loved to hear more solo piano on this album, but the voices and symphonic strings certainly add to the drama of the music. Piano Odyssey begins with a soulful arrangement of George Harrison’s “While My Guitar Gently Weeps,” one of my favorite Beatles songs. I have played this track many times! The album also includes Wakeman’s very credible arrangement of The Beatles’ “Strawberry Fields Forever.” The medley of Franz Liszt’s “Liebestraume” and Wakeman’s own “After the Ball” was a surprise, but I didn’t remember that Wakeman composed the score for Ken Russell’s 1975 film, Lisztomania (wow!). There are two Yes songs - “And You & I” and “Roundabout.” Another surprise is a cover of Simon and Garfunkels’ “The Boxer” (1969), arranged for piano, strings and choral voices (no lyrics). My two other favorite tracks are Wakeman originals: the mysterious and poignant “Cyril Wolverine” and the Baroque-ish and high energy “Jane Seymour” (from The Six Wives of Henry VIII) which clearly shows that Wakeman still has some very impressive piano chops! The album closes with Queen’s “Bohemian Rhapsody” arranged for piano with strings and choir. It’s really interesting to hear this as an instrumental arranged in such a classical style! Piano Odyssey is truly an amazing album and a trip down Memory Lane for those of us old enough to remember some of these pieces in their original incarnations. The album is available from Amazon, iTunes and many streaming services. Check it out!